Graham Greene is one of my favourite novelists. His talent is in his concision. He is able to say in 200 pages what it would take many other writers 400. The Quiet American manages to be a thriller, a detective story, a romance and a historical fiction in just 167 pages, about 60,000 words. How does he do it? I decided to find out. Vietnam in the 1950s, during the French war. The viewpoint character is Thomas Fowler, a cynical British journalist who has been covering the French war in Vietnam for some time. Alden Pyle, the quiet American of the title, has been murdered. Vigot, a French detective, is trying to find out who did it. He suspects that Fowler may know something about the murder, but Fowler denies everything. Fowler and Pyle have been competing over the last few months for the affections of a Vietnamese girl, Phuong, Fowler’s lover of two years. Fowler is unable to offer Phuong anything concrete: he is already married and his wife refuses him a divorce. Pyle, on the other hand, is young and has good prospects. In the course of his courtship of Phuong, Pyle saves Fowler’s life. But when bombs start going off in Saigon, Fowler discovers that Pyle has something to do with it. He tells a communist contact that Pyle has “got to be stopped”. Pyle is murdered. Phuong returns to Fowler, whose wife has now granted him a divorce. Vigot can’t prove a thing. I divided the book up into its parts, then into its chapters, then into its sections within those chapters, then down into its scenes within those sections in order to build up an anatomy of the novel. The Quiet American is split into four parts. The first two parts take up two-thirds of the novel. Part 1: 55.5 pages in 5 chapters and 16 scenes. 1300 words per scene. Part 2: 64 pages in 3 chapters and 14 scenes. 1700 words per scene. Part 3: 26.5 pages in 2 chapters and 9 scenes. 1100 words per scene. Part 4: 21 pages in 3 chapters and 7 scenes. 1100 words per scene. Already we can see that, as the novel progresses, the pacing of the scenes increases. 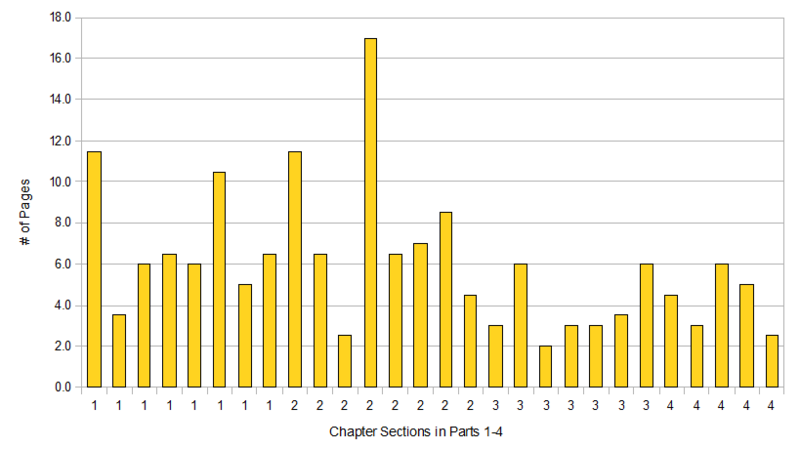 The Quiet American: chapter section length in pages. One of the fascinating aspects of the novel is Greene’s use of narration and flashback. 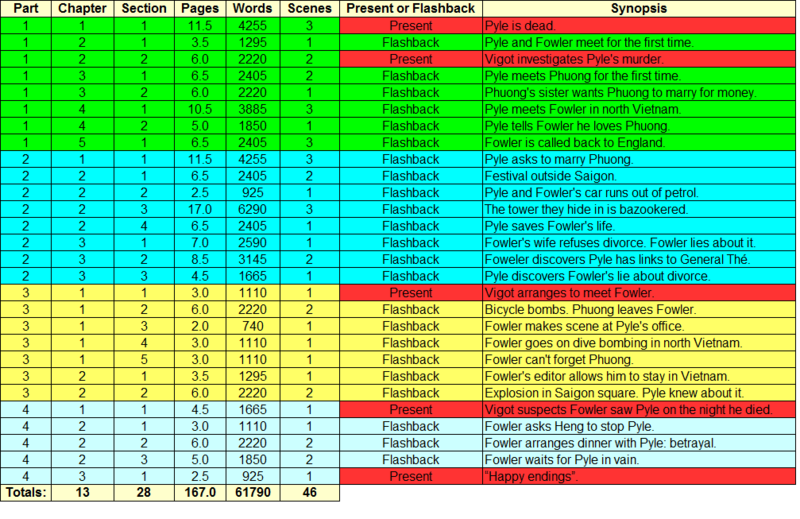 The novel is mostly told in flashback, with Fowler recounting the events leading up to Pyle’s death. In fact, there are only 8 scenes in the whole novel which are told in the present (17%). The rest is flashback (83%). The whole of the longest part of the book (Part 2) is told in flashback. This is the most dramatic part of the book. And yet it is the present narration that adds the suspense to the book: did Fowler have a hand in Pyle’s death? Will Vigot find out? Why did Fowler do it? The fact that Greene is able to keep these questions in the reader’s mind without detracting from the sense of immediacy during the flashbacks shows great skill. The placing of these scenes may give us a clue. 5 of the first 6 scenes take place in the present. In these, Greene establishes Pyle’s death, the relationship between Fowler and Phuong and the investigation into Pyle’s murder by the French detective Vigot. Then there are 24 consecutive flashback scenes, taking us through the rest of Part 1 and the whole of Part 2. There is not another “present” scene until scene 30 of 46, at the very beginning of Part 3 (1 out of 9 scenes in that part). Finally, the first and last scenes of Part 4 are also present (2 out of 7 scenes in that part). In this way, Greene is able to give the story a good push at the beginning and then only has to give us a little nudge in the middle, to remind us of the ongoing investigation, before wrapping things up at the end. The Quiet American: detailed analysis. Through close examination of the way that great novelists have solved the problems of plot and narration, we can improve our own writing and understand how great novels work. I hope this article helps you as much as it has me!